This plant is for me a holy grail, it has a unique ability to mimic the leaves of the plant it is growing on even to the extent of having completely different leaves on the same plant if it grows over two different trees. "Boquila’s leaves are extraordinarily diverse. The biggest ones can be 10 times bigger than the smallest, and they can vary from very light to very dark. In around three-quarters of cases, they’re similar to the closest leaf from another tree, matching it in size, area, length of stalk, angle, and color. Boquila’s leaves can even grow a spiny tip when, and only when, it climbs onto a shrub with spine-tipped leaves." Edible berries apparently appreciated in Chile to boot! 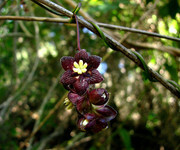 Also a vine and considered a delicacy in Chile and sold in some markets. Calledcoguil or cógüil in Mapuche language. 7-8cm long purple sausage shaped fruits sweet and pulpy. Beautiful flower! Ok, so I haven't personally tried the fruit, but having talked to a couple of people who have, they assure me that it is pretty awful and not something worth growing. From memory both of them had assumed they'd taste like Asimina, but apparently they are nothing like this whatsoever. Are you talking about the last one Lardizabala Starling? Yes, the lardizabala. A friend of mine spent a long time waiting for it to fruit and was ultimately very disappointed. There must be something to the fruit for it to be sold in certain Chile markets, maybe its an acquired taste or something not suited to the western palate? Luisport I hope you keep us updated on their progress! Could you post some pictures of your plants pretty please? Im glad you didnt tell me the Boquila tastes like crap Starling! Any updates / new information about this family? The only thing I've found to add concerning Zabala (since almost all pages repeat that "sweet and pulpy, sold in Chile" line in various forms) is this: http://crescentbloom.com/plants/specimen/LA/Lardizabala%20biternata.htm - unlike everyone else repeating that line, they say it's bland. Perhaps it's variable? Who knows. If buying it, finding a good source of seeds would probably be very important. Found almost nothing about Boquila fruit quality. Fascinating plant, though! Akebia seems to have some breeding programmes going for it in China and Japan and is considered to have significant potential (A. trifoliata seems to be the most researched for food potential, while A. quinata is most common in the horticultural trade). Random wild / horticultural Akebias apparently vary significantly in fruit quality, from delicious to cloying (some people hate the texture, too, while others don't). Due to the seeds it's sort of eaten like a pomegranate, but is apparently easier to eat than a pomegranate. Apparently poorer specimens are improved with lemon juice or other fruit that add acid. Plants are monoecious but fruit set requires cross pollination not merely between plants, but between cultivars; hand pollination also helps. Seems to require full sun to get a good crop. The nutritional profile is quite good, and it has some interesting chemical properties that make it of interest in skin care products. To get a good taste, it's important to pick ripe - after it opens if you plan to eat it right away, otherwise a week or so before it opens. The fruit stores very well, up to three months if refrigerated. The flowers are of course well known for their scent - some say chocolate, others say vanilla and sometimes a hint of allspice. Akebias are very aggressive and can grow up to 15m long. There's a lot of other edible Lardizabalaceae that I'm looking into. Some species in the family may even have potential to be raised outside here if sheltered well enough. An interesting, obscure family! Thanks for the info and resurrecting this thread Karen! I forgot a bit about my quest ha ha. Any one know of good seed sources? Otherwise, you can just buy seeds off the horticultural markets and hope you get a good one. If you want to up your odds on boquila and zabala, you could try contacting, say, a botany department at a university in Chile and asking them for advice on how to get a good variant. If you do get in touch with anyone about getting improved cultivars, definitely report back! Yeah, I did my research on that one just last night. While Useful Tropical Plants quotes two contradictory descriptions of the flavour, one stating that it's insipid, all of the individual taste reviews I found say (after the person gets over the appearance!) that it's pretty good, with a "sweet watermelon" flavour. Just as a note, it dies back to the ground each year in USDA zone <= 6, but then regrows from its roots. BTW, if you get out a chance, check out Akebia's nutritional profile (I assume that Decaisnea's is similar). Very healthy, but unusual! For example, the main acid is not citric, malic, succinic, tartaric, oxalic, quinic, etc like in most fruits, but rather lactic! There's a couple other things unusual in its profile, but I can't recall them off the top of my head. It's a bit fattier than most fruits, at 1,5% (although not as much as durian, and certainly nothing like an avocado), and it has an unusually high ash (aka, mineral) content (over 6%). Vitamin C per gram ranges from 1,5x to 14x that of oranges. Apart from all the sugar, it's health food! I will definitely try Decaisnea this year, it seems to be very interesting for my growing zone. Problem is only with good seed source. I try several times to germinate them (stratified, without stratification) no one of big amount germinate Seed were probably very old or not properly stored.